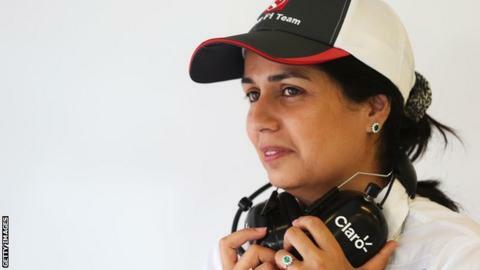 Monisha Kaltenborn has become the first female team principal in Formula 1, taking over at Sauber. Kaltenborn, 41, who already held the post of chief executive officer, will take on the additional role starting at this weekend's Korean Grand Prix. Outgoing boss Peter Sauber, who entered F1 in 1993, will remain as Sauber group's president of the board. He said: "I'm in no doubt that Monisha has all the necessary skills to be an outstanding team principal." In May, Sauber transferred a third of team's equity to Kaltenborn in the form of a gift. He said: "We decided a long time ago that Monisha would take over from me, but we left the timing open. "Now is a good time for both of us, so this is the right moment to pass on the baton. After all, there have been a number of races I've been unable to attend." Kaltenborn joined Sauber in 2000 to run their legal department. She joined the board soon afterwards, before taking over as CEO in 2010. She said: "I have set my sights high and am committed to taking the team forward as Peter Sauber would want and leading it on to success. "It is a lot of responsibility because if you mess it up it is even worse than if a man were to do that because people will probably point and say after all she was just a woman. You have to be more careful and maybe that creates a bit more pressure than if a man had risen to the same position. "I hope it will change [having more women]. F1 is a bit slow on that. I hope more women will come up and the most important thing is to give them the opportunity. "Women have the education, the confidence and the competence, but they simply need that opportunity." Red Bull team principal Christian Horner said: "It's great for Monisha. She has done a super job at Sauber over the last few years, she has been effectively been performing that role without the job title. "It's good for her and for women in motorsport. In our own team we have more and more women taking predominant roles. It is very healthy and should be applauded." Sauber entered F1 as the works team for Mercedes engines, but continued as a privateer until they were bought by BMW in 2006. The team achieved their only victory during the BMW era, when Robert Kubica won the Canadian Grand Prix in 2008. BMW's withdrawal at the end of 2009 cast doubt on the team's future, but Sauber were able to raise the money to continue. The team are sixth in the constructors' championship after scoring four podium finishes this season, the most recent of which came via Kamui Kobayashi at last weekend's Japanese Grand Prix. Race 07:00 BST; BBC One, online and BBC Radio 5 live (from 06:00). Race replay 14:00 BST; BBC One. Highlights 19:00 BST; BBC Three.